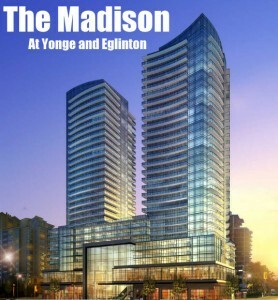 The Madison at Yonge and Eglinton is a new condominium project by Madison Homes and it is currently in preconstruction at 97 Eglinton Ave East in Toronto – the project is scheduled for completion in 2015. The available condos start in the $380,000’s and the project has a total of 646 units. The Madison has a 33-story and 30-story tower and shares an eight-story podium. The ground and the second floor will be facing Eglinton Ave and will be home to approximately 53,000 sq. ft. of retail space. The shared onsite amenity area is located on the fourth floor within the podium and it is accessible from both towers. This level provides 16,254 sq. ft. of indoor amenity space plus an adjoining 6,204 sq. ft. of outdoor amenity space that is designed to serve as an extension of your indoor space. -Sitting areas with TV, wet bar, terraces, fire place, Wi-Fi. There is another outdoor amenity area on the eighth floor. This area features an additional 5,638 sq. ft. of space located between the two towers on top of the podium. It is designed as a Zen-style outdoor garden retreat with a water feature at its center. 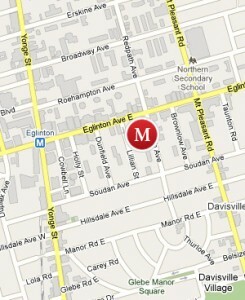 The Madison will be located on 101 Eglinton Ave East, two minutes east from Yonge and Eglinton Subway Station.